← Caption Contest 4 Winner! Caption Contest 5: Chimps and Androids! The person who can come up with the best dialog posted to the comments below for the following comic book panel will win a free black and white custom illustration of his or her choice by yours truly. So put on that thinking cap and start with the jokes already! Chimp: See, I told you, all you have to do to get this monkey off your back was to take me to see the "Ya Ya Sisterhood" movie marathon! Good luck! I got a bit behind on the winner from last week but I'm working on it now, and will post it as soon as it's done. 34 Responses to Caption Contest 5: Chimps and Androids! Monkey: Hey Doc, we better back up. We don’t have enough road to get up to 88. Android: Roads? Where we’re going we don’t need…roads! Chimp: AAH! It’s Hillary Clinton! Android: Please, it’s just an urban legend. Chimp: Hey guys! Who wants candy from my giant Pez dispenser?!? Android: *sigh* It’s a living. Chimp: I didn’t realize that they were called mad scientists not just because they were nuts, but because they’re generally PO’d at their henchmen. Android: Peeing in his coffee didn’t help any. Chimp: Domo arigato, Mr. Roboto! Chimp: Do you want me to cook something for you? After all, you did order the George Foreman Gorilla! Chimp: Wow! Geico.com now insures androids too! Android: So easy, a monkey can do it. Chimp: Onwards to the banana factory, Android! I must possess the Banana of Zarkon instead of Dylon! Android: Yes, master…You know, one day I’m gonna have you removed from my head, primitive ape. Chimp: Yes, finnaly, the shiny banana will be mine!Onwards, Mr. Roboto! We need to get to that banana before the others. Android: I can’t believe I ended up in “Planet of the Apes”. “Star Wars” seemed so fitting. Damn you C3PO, damn you to hell! Monkey: This play, “Much Ado About Nothing”, is it? It’s AMAZING!!! Who wrote it? Android: I think they stuck a large group of monkeys in a room with something known as typewriters, which where 19th centurytyping instruments. Then out of that came what they call “Shakespeare”. Man I love e-bay, hey, look a gorilla costume for you for only 99 cents. Ooooo! I do belive a ~used~ gorilla costume for only 99 cents is not even worth that, some things are not really bargins. Monkey: Oh…My…God! Look at that banana plantation QN-54! Monkey: Sorry, pal. Wrong movie. It’s been done. Niall, I like that one, but the dialog’s in the wrong order. 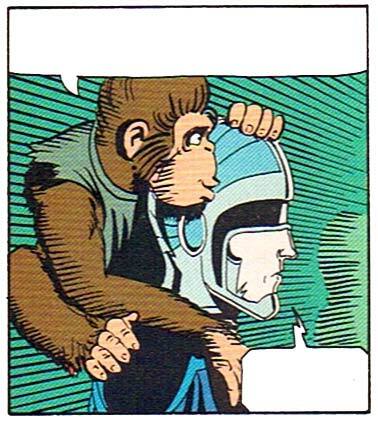 Comics panels are read top left to bottom right; the monkey’s speaking first, not the android. If I put your words in there, it won’t read correctly. I’m not saying this idea will win, but for it to even really qualify as an entry it needs to be reworked so the monkey speaks first. Monkey: I know what you’re thinking! ‘Get yer stinkin’ paws off me you damn dirty ape!’ You really shouldn’t leave your DVDs in the player like that. Android: So that’s how he does it! Monkey: Your problem is obvious, Commander. Android: ooh, what’s that glowing? Is that Mr. Vandersluis? Android: Ooh – what’s that glow? I think it’s Mr. Vandersluis! Chimp: Thanks for inviting me over to watch football. I gotta admit I get kinda lonely at home by myself. The bachelor life just isn’t what it cracked up to be, you know? One monkey with his own cage, flinging his poo wherever he wants, but then you really start to miss some regular huma… social interaction, you know? Android: Firstly, this sofa is a six seater, how about shooching over a bit? And second, no matter how lonely you get, the I/O socket at the base of my neck is FOR DATA CABLES ONLY! Chimp: Wow. When you said you’re dad was going to blow up if he ever found out about us living together I didn’t even think to take it literally!?! Android: *sniff* me neither. I was only expecting a critical software failure. ***ARGH*** I can’t believe I mixed up ‘your’ and ‘you’re’ in that last post… please edit. Chimp: Now THAT’S a blue screen of death! Monkey: When I read the warning that said “cooking eggs in a microwave may cause explosion” I assumed it was the eggs that were going to explode. I mean, that would have been cool! Oh… and sorry about your kitchen. Android: From now on, I do the cooking, you do the vacuuming. Android: Hey! I didn’t pay out on that “Poo flung at canvas” exhibition we went to last week, so back off! Adriod: Yes, you’d still be a pain in my arse.